Resource Materials you can DOWNLOAD AND EDIT! November 2014 - Feature Campfire - Live a Healthy Life! Food, Nutrition and Exercise. April 2014 - Feature Campfire - Fairy Tales ... Dreams Really Do Come True! March 2014 - Feature Campfire - Irish and Everything Green! January 2014 - Feature Campfire - Sing, Sing A Song! June 2013 - Feature Campfire - Summer Fun! March 2012 - Feature Campfire - Soar Like An Eagle - Celebrating Native Culture! January 2012 - Feature Campfire - A Winter Night's Dream! 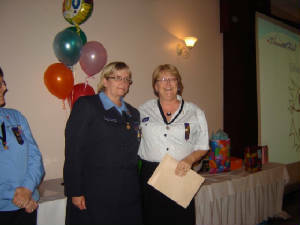 Dawn has been a member of Girl Guides of Canada for 24 years. As a child she participated in the Brownie, Guide and Ranger programs in Grande Prairie, Alberta (there was no such thing as Pathfinders back then.) Dawn was truly blessed to have parents who provided her with many camping and music training camp opportunities at the District, Area and Provincial levels over the years. 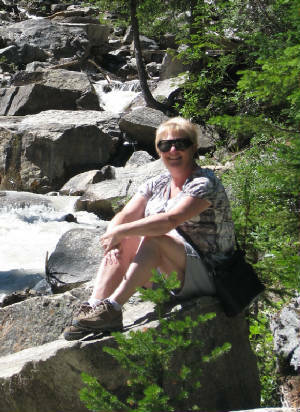 She developed her love of Guiding Music and Campfire Planning while attending a Music Camp held in Red Deer, Alberta in 1972. She has been hooked ever since. During the mid-70’s, Dawn assumed a position with Boy Scouts of Canada as a Cub Leader. Again, camping and music remained a big part of her life. She slipped away from Guiding and Scouting until the mid-eighties. It was at that time her daughter, Kelly decided to join Guides. It was also at that time Dawn decided it was time to get involved in the Guiding movement again. She became a Guide Leader for the 133rd Guide Unit in Edmonton and also assumed the position of “Music Advisor” for Northeast Edmonton. During her time as Music Advisor, Dawn created a monthly newsletter “Musical Notes” to encourage Northeast leaders to incorporate Music, Drama and Dance in their programs. She ran many training sessions and was always looking for ways to help with Campfire and Program Planning. Kira, her youngest daughter, also went through the Guiding program. Music was always a big part of the 133rd Guide Unit in Edmonton. The unit placed in the top 3 for many years in the Provincial Arts Competition. When Kira decided not to continue on to Pathfinders, Dawn decided to stay. She has been actively involved as a trainer in the Edmonton Area and as a Leader at Large in the Northeast District. As a trainer, Dawn has had the joy of working with many NEW and EXISTING leaders on a regular basis. She has always been a collector (almost since day one) of ideas for camps and campfire programs, etc., so to help leaders excel, Dawn created this website “Guiding with Guider Dusk” in 2005. The site provides links, tools, resources and ideas to help leaders, camp directors, teachers, etc. incorporate performing arts in their programs, camps, classrooms and campfires. To ensure the art of Campfire Program Planning, singing, dancing and drama remained an important part of the Guiding program, Dawn provides many training opportunities to the leaders and girls in Edmonton Area on a regular basis; her favourites programs being the yearly Arts Revels, Campfire Magic and Music is Fun Camps. Dawn has been a member of Music Ministry at many Catholic Churches over the past 30 years. She has experience planning celebrations, directing small and large groups. She plays several wind instruments and guitar. Dawn spent two years on the Board of Directors for Camp Encounter, a Catholic-Christian year-round camp located 1 hour northwest of Edmonton. Her Guiding experiences and business background from working at TELUS were a real asset in this position. Dawn was the Spiritual Director for the Catholic Girls League till December 2013 (girls ages 10-17) at St. John Bosco Church in Edmonton. Like Guiding, service and community involvement are a big part of the organization. For Dawn, it's all about developing leadership skills in young women so they can thrive in today's communities. Although the resources on this site may tend to have a bit of a "Guiding Flavor," know that the information shared can be used for any CAMP SETTING, BOYS OR GIRLS CLUB, SCHOOL CLASSROOM ACTIVITIES, etc. This site is for YOU! Dawn’s goal is to help you find links, tools, resources and ideas to help you with planning and developing performing arts programs, campfire themes and many magical campfires for your camps and special events. If you are unable to find what you are looking for, please do not hesitate to "CONTACT HER" She will research your request and provide you with resources to help you with your planning. Drop me an e-mail at dnowicki@telusplanet.net. I'm looking forward to hearing from all of you!